Adjust the URL to match your own site. Then go through the other fields and turn off all caching. This rule will override the settings for the rest of your site and let you through to change it without caching getting in your way. Then set the custom caching drop-down to `Cache everything`. That will let all the static and dynamic HTML pages also be cached in Cloudflare servers all around the world. Now your visitors will be pulling compressed versions of your pages with all the optimisations that Cloudflare apply from the servers closest to them. 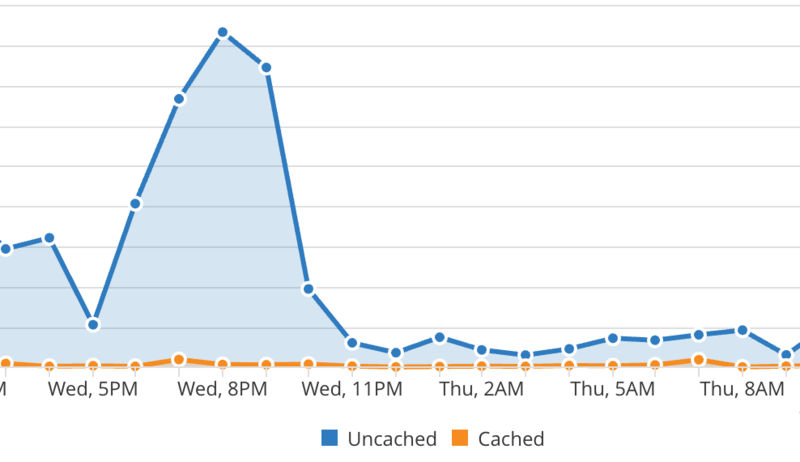 The result should be a graph more like the one below with lots of cached traffic shown as the orange trace here. Just to check the page rules are working I ran a little wget job (with sensible random waits) on this site repeatedly. I configured wget to only request html pages, not images, css, etc. On the left below we see Cloudflare caching the html pages while undergoing this repeated site mirroring. Just to confirm it is these rules that make the caching of HTML work I reran the experiment with the page rules disabled The mirroring of html causes a big spike in uncached traffic in this case, as shown on the left below. These two experiments show that Cloudflare doesn’t cache HTML by default but you can easily force it to do so with the simple page rules given above. This strategy can let you run a high-traffic site off a cheap shared hosting provider. Why not try setting up a website with Bluehost or 1and1 and then turning on Cloudflare with these rules for yourself? Interesting approach. But let’s say you browse your blog while you’re logged in: wouldn’t cloudflare cache the article you just published with you being logged in with all the meta stuff loke “edit article” and so on for everyone to see? I see what you are saying there. From a little test I just did with an incognito browse, not visually, no, and of course the random visitor would not actually be logged-in and so would be unable to do anything with the dashboard gui if it did show. Please let me know if you spot any information leakage that could be an attack vector. Hello, are you sure that you can force cloudflare to cache everything so easily ?! I think so. I’m mirroring this site in a loop ATM to check this is all still working. See the results of the loop in the edit above. HTML caching is working.